A member-owned 350 kilowatt solar electric array featuring more 1,100 solar panels is being explored on a site near Rockland's South End. ROCKLAND, Maine — The potential for a solar farm with more than 1,100 panels is being eyed for Rockland. The system, designed by ReVision Energy of Liberty, could produce more than 400,000 kilowatt hours of electricity annually for up to nine shareholders, according to Sue Jones, the company’s community solar farm director. Jones said it would be the largest community solar farm in the state if built. The amount of electricity could power 67 average homes for a year. A presentation regarding community solar farms by the company is scheduled for 6:30 p.m. Tuesday, Aug. 11, at the Rockland Public Library. John Root, Rockland code enforcement officer, said Friday no application has been filed with the city but that there had been some inquiries from the company earlier this year. He said that if the company applies, the planning board would review the project. The property is located in an industrial zone. The panels would stand about 10 feet tall. 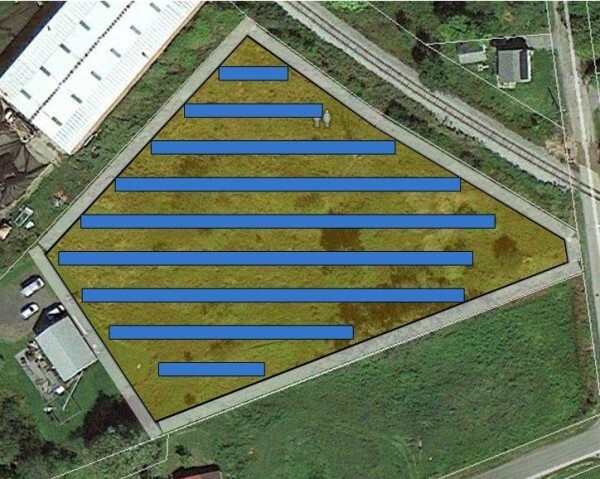 The solar farm would be located at 62 Holmes St. in Rockland, near Broadway, on 2.5 acres owned by Jason Philbrook. The first two community solar farms in Maine have installed within the past year in Paris and in Edgecomb, which have 150 and 182 solar panels, respectively. The Liberty-based company stated in the news release that the solar farm being explored in Rockland would be member owned and generate 350 kilowatts for up to nine shareholders. The only qualification for the shareholders is that they are located in Central Maine Power territory. To maximize the farm’s potential, each share would be 15 kilowatts or greater, the equivalent of about 1,500 kilowatt hours per month, according to the news release. Jones said the project could move forward with one shareholder and as many as nine. She said the company has no commitments yet but have several parties interested in becoming owners of the project. She said the meeting in August is a way to solicit more interest. If sufficient shareholders commit, the plan would be for ReVision to construct the solar farm this fall. Interest in pursuing community solar projects has been on the rise in Maine. Belfast had 180 panels installed on its fire station last winter, and Freeport is helping to arrange group purchases of solar panels that local residents would have installed on their properties. Bangor, Bar Harbor, Damariscotta, Scarborough and South Portland are among other cities and towns in Maine that reportedly are considering municipal solar projects. Higher learning institutions that have installed or hope to install solar arrays to help meet their energy needs include Bowdoin College in Brunswick, Thomas College in Waterville, Unity College in Unity and College of the Atlantic in Bar Harbor. Large, private solar development projects also have been proposed in Gouldsboro and in the Knox County town of Washington. According to ReVision’s news release, community solar farms make solar energy possible for homes or businesses that, for aesthetic or practical reasons, don’t have the ability to put it on their own roofs. With community solar farms, a group of homeowners or businesses is paired with a landowner host. The group invests in a large solar array, ideally built in an open field, and 100 percent of the solar generation is sent to the grid and automatically credited to the electricity accounts of each member of the group based on their ownership percentage stake in the solar farm. ReVision Energy was founded in 2003. ReVision Energy installed more than 4,000 solar energy systems across northern New England, with offices in Liberty and Portland, as well as in Exeter and Concord, New Hampshire.